Please note that the content of this book primarily consists of articles available from Wikipedia or other free sources online. AutomatedQA Corp. is a software company specializing in automated software testing tools and developer tools. It was founded in 1999 in Las Vegas, Nevada, and is currently based in Beverly, Massachusetts. 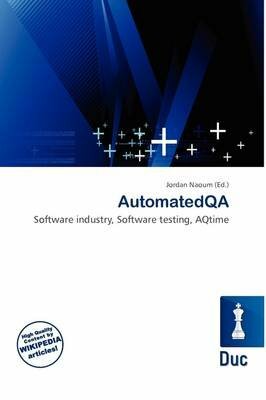 The first product released by AutomatedQA was AQtime, a binary instrumentation profiler to help optimize performance for applications developed with Microsoft and Borland compilers. It was released on November 12, 1999. The first version of TestComplete, AutomatedQA's automated software testing tool, was released in December, 2000. In 2004, AutomatedQA released Automated Build Studio, an automated build management and continuous integration application.